XL, Young God, hinah, Reprise, Nonesuch, Warner Bros.
Banhart was born May 30, 1981 in Houston, Texas, to a Venezuelan mother, María Eugenia Rísquez, and an American father, Robert Gary Banhart. His given name is a synonym for Indra (Hindu), which was suggested by Prem Rawat, an Indian religious leader whom Banhart's parents followed. Banhart's middle name Obi was modeled after Obi-Wan Kenobi, a Star Wars character. Banhart's parents divorced two years after his birth and he moved with his mother to Caracas, Venezuela. His mother later remarried and Banhart's stepfather moved the family to Los Angeles, when Banhart was 14 years old. Banhart cites Axl Rose, Kurt Cobain, Mick Jagger, Nusrat Fateh Ali Khan, and Ali Farka Toure as his inspirations to begin singing. When he found that he could not match their singing styles, he found success in singing in a "feminine style." Banhart and Gira compiled an album from Banhart's recordings, and in 2002, Oh Me Oh My, which was made up of short fragments, was published by Young God Records and received favorable reviews. He recorded two other albums and an EP for the label: Rejoicing in the Hands, Niño Rojo, and The Black Babies; the releases had a simple acoustic sound. Banhart changed to XL Recordings in 2005 and released Cripple Crow, which was recorded in Bearsville Studios, New York and had a more elaborate sound. Banhart’s albums offer a variety of musical sounds, and he is often called the leader of the musical movement termed "Freak Folk." His lyrics are fantastical, idealistic, and poetic with the occasional trace of innuendos. Additionally in 2005 Devendra collaborated with Antony and the Johnsons on the award-winning album I Am a Bird Now. Banhart sings the introduction to the song "Spiraling" and plays guitar on "You Are My Sister" in which Boy George also appears. Devendra was the first artist to design a t-shirt for the Yellow Bird Project, in 2006. He chose to donate the profits from the sale of his T-shirt to the Teenage Cancer Trust. In 2007, he started a relationship with actress Natalie Portman. Banhart released an album in 2008 entitled, Surfing, with Megapuss – a collaborative project with Gregory Rogove and Fabrizio Moretti of The Strokes and Little Joy. Comedian Aziz Ansari is featured on the album's track "Duck People Duck Man" under the alias "Grandpa P Darwish". He is a collector of music artifacts. Banhart wrote the foreword for and appears in his friend Lauren Dukoff's book Family: Photographs by Lauren Dukoff. He has also written the introduction to a selection of poems by Kenneth Patchen. The film Life During Wartime, directed by Todd Solondz, features a musical collaboration between Banhart and Beck. The song plays over the film's end credits. Banhart sings lead vocals while Beck adds backing vocals and also recorded the track. The lyrics were written by Solondz and the music by composer Marc Shaiman. Banhart is an avid skateboarder, and in March 2010 broke a bone in his right leg while skating, only hours before a concert in Phoenix, resulting in the cancelation of future shows in Utah and Colorado. In 2011, he collaborated with Marisa Monte and Rodrigo Amarante on a version of the song "Nú Com a Minha Música" for the Red Hot Organization's most recent charitable album "Red Hot+Rio 2." The album is a follow-up to the 1996 "Red Hot + Rio." Proceeds from the sales will be donated to raise awareness and money to fight AIDS/HIV and related health and social issues. In April 2012, Banhart took place in artist Doug Aitken's audiovisual project "Song 1" at the Hirshorn Museum in Washington D.C. Banhart joined Beck and James Murphy of LCD Soundsystem in performing "I Only Have Eyes For You" for the project that uses eleven high-definition video projectors working in tandem to blanket the museum's entire surface with a video of the performance. On December 3, 2012 Banhart announced his new album, Mala. The album was released on March 12, 2013, and was Banhart's debut album for Nonesuch. In June 2016, Banhart released the first track of his ninth studio album, Ape In Pink Marble, titled 'Middle Names'. In August 2016, Banhart released the second track of his ninth studio album, titled 'Saturday Night'. His ninth studio album, Ape In Pink Marble was released on September 23, 2016 on Nonesuch Records. Drawings by Banhart were featured in the San Francisco Museum of Modern Art and in the Centre for Fine Arts, Brussels. Banhart's drawings have also been featured in the Art Basel Contemporary Art Fair in Miami, FL, the Mazzoli Gallery in Modena, Italy, Spain's ARCOmadrid. and the Andrew Roth Gallery in New York. His drawings were featured in MOCA's exhibit "The Artist's Museum", in which the works of influential Los Angeles based artists from the last 30 years were presented. As part of the exhibition Banhart collaborated with artist Doug Aitken and musicians Beck and Caetano Veloso for a musical and visual performance piece. Banhart was a participant in Yoko Ono's second Water Piece project. He read Joan Miró's poem "A Star Caresses the Breasts of a Negress" for the recorded guided tour of Tate Modern. In June 2015, Banhart released a collection of drawings, paintings, and mixed media pieces, titled "I Left My Noodle on Ramen Street," published by Prestel Publishing. In November 2018, Devendra Banhart will curate part of the program for the Dutch Le Guess Who? festival. 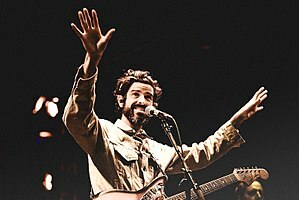 Banhart's music is often associated with the New Weird America genre, along with Vetiver and Joanna Newsom. The New York Times has called his songs "free associative work" and SPIN magazine has written that "Banhart's albums offer ashram-appropriate guitar strums, trippy-hippie tone poetry." Various publications have described his style as psychedelic folk, avant-folk, freak folk, Lo-Fi, hipster folk revival, and alternative folk. Some reviewers, including AllMusic, The Times, and Mojo, have pointed out similarities between Banhart's songs and production with that of the early 1970s band Tyrannosaurus Rex (an early version of Marc Bolan's T. Rex). In a May 2004 interview with Arthur magazine, Banhart stated that he was unaware of the music of Tyrannosaurus Rex until after he began writing and recording songs. Devendra Banhart instead prefers to credit Vashti Bunyan, Caetano Veloso, Simon Diaz and Arthur Russell among his main influences. Banhart's live band has had multiple names, including Spiritual Bonerz (the 'z' is silent) and The Grogs. ^ a b c d Campion, Chris (August 12, 2007). "Stranger than folk". The Observer. Retrieved 2009-05-07. ^ Bemis, Alec Hanley (August 28, 2005). "The Soft Revolution". Los Angeles Times. Retrieved 2009-05-14. ^ a b c d e f Kamps, Garrett (January 8, 2003). "Man of La Mantra". SF Weekly. Retrieved 2009-04-20. ^ a b c d e Beck, John (April 17, 2009). "The wide, way-out world of Devendra". The Press Democrat. Archived from the original on April 21, 2009. Retrieved April 23, 2009. ^ Banhart, Devendra. "Stirring Ska, Rock, R&B and Hip-Hop into a Freak-Folk Stew. "New York Times (1923–Current file), New York, N.Y., 2009. ^ a b c Vaziri, Aidin (October 26, 2005). "Sweet, shocking, mesmerizing – Devendra Banhart follows his sprawling, childlike musical muse". San Francisco Chronicle. Retrieved 2009-04-20. ^ a b c Bemis, Alec Hanley (December 12, 2004). "Freak Folk's Very Own Pied Piper". The New York Times. Retrieved 2009-04-20. ^ a b c d e MacNeil, Jason; Loftus, Johnny. "Devendra Banhart – Biography". Allmusic. Retrieved 2009-04-20. ^ Alec, Hanley B. "Freak Folk's very Own Pied Piper." New York Times (1923–Current file), New York, N.Y., 2004. ^ Nme.Com (2007-01-31). "Clap Your Hands, Wolfmother design T-shirts". Nme.Com. Retrieved 2016-09-23. ^ "Artist Chart History – Devendra Banhart". Billboard. Retrieved 2009-04-20. ^ "Nick & Norah's Infinite Playlist Offers A Devendra Banhart Cameo, New Vampire Weekend". Stereogum. August 14, 2008. Retrieved 2009-08-13. ^ Nelson, Steffie (August 9, 2009). "Lauren Dukoff's 'Family' photos of free spirits". Los Angeles Times. Retrieved 2009-08-22. ^ Cromelin, Richard (June 28, 2008). "Devendra Banhart in tune with Gilberto Gil". Los Angeles Times. Retrieved 2009-08-22. ^ Vozick-Levinson, Simon (April 13, 2009). "Papercuts' 'You Can Have What You Want': Stream this indie gem here". Entertainment Weekly. Retrieved 2009-04-23. ^ "Elliot Roberts: Overview". Allmusic. Retrieved 2009-08-16. ^ "Megapuss Revealed or I Believe Your Dickskirt Is Caught in My Microphone". The Fader. June 19, 2008. ^ "Warner Bros. Signs Devendra Banhart". August 3, 2009. Retrieved 2009-10-26. ^ "Oasis ask Devendra Banhart to remix them – audio". NME. June 10, 2009. Archived from the original on October 15, 2012. Retrieved August 14, 2009. ^ "Listen: Devendra Banhart Remixes Phoenix". Pitchfork. September 28, 2009. Retrieved 2009-10-09. ^ a b Lindsay, Andrew. "Beck, MGMT & Banhart cover Leonard Cohen". stereokill.net. Archived from the original on January 10, 2010. Retrieved April 8, 2012. ^ Nelson, Steffie. "'Family': Devendra Banhart and other free spirits". Los Angeles Times. Retrieved 2009-08-19. ^ "Family". Amazon.com. Retrieved 2009-08-19. ^ "53rd Grammy Awards Best Recording Package Nominees". WEb.archive.org. Retrieved June 9, 2018. ^ "LISTEN: Banhart, Beck Movie Soundtrack Collabo". SPIN. Retrieved 2012-04-08. ^ Dayal, Geeta (April 18, 2012). "Doug Aitken's Song 1 Wraps Museum in 360-Degree Panoramic Video". Wired. ^ Lozano, Kevin. "Devendra Banhart Announces New Album Ape in Pink Marble, Shares New Track Middle Names: Listen", Pitchfork, 24 June 2016. Retrieved on 26 June 2016. ^ "Devendra Banhart – Middle Names [Official Audio". YouTube. 2016-06-24. Retrieved 2016-09-23. ^ Yoo, Noah. "Devendra Banhart Shares New Song "Saturday Night": Listen", Pitchfork, 29 August 2016/ Retrieved on 29 August 2016. ^ "Devendra Banhart – Saturday Night [Official Audio". YouTube. 2016-08-29. Retrieved 2016-09-23. ^ "Abstract Rhythms: Paul Klee and Devendra Banhart". San Francisco Museum of Modern Art. Retrieved 2009-08-13. ^ "It's not only Rock 'n' Roll, Baby!". Centre for Fine Arts, Brussels. Archived from the original on January 13, 2009. Retrieved August 13, 2009. ^ "Behind the Music: Devendra Banhart's Visual Art Takes Center Stage". Fast Company. Retrieved 2012-04-08. ^ "Grapefruit: Yoko Ono in 1964". Isefoundation.org. Retrieved 2013-02-19. ^ "Tate Podcasts". Tate Museum. Retrieved 2006-05-26. ^ "Devendra Banhart Is Putting Out a Book Titled I Left My Noodle on Ramen Street". Pitchfork. Retrieved 2006-05-26. ^ "Revealing the curators & initial line-up for Le Guess Who? 2018". www.leguesswho.nl. Retrieved 2018-06-21. ^ Rutledge, James (November 5, 2004). "Joanna Newsom and the New Weird America". BBC. Retrieved 2009-05-02. ^ "Devendra Banhart on SPIN.com". SPIN.com. October 27, 2009. ^ Hall, Nicholas (April 7, 2009). "Devendra Banhart's footloose folk". SF Weekly. Retrieved 2009-05-02. ^ Burton, Brent (November 11, 2005). "Irregular Folk". Washington City Paper. Retrieved 2012-04-08. ^ AllMusic page: "Devendra Banhart biography." ^ The Times article: "Devendra Banhart: What Will We Be." ^ a b Splendid article: "Features: Devendra Banhart Archived December 17, 2008, at the Wayback Machine." ^ Stylus Magazine article: "Cripple Crow review Archived October 27, 2011, at the Wayback Machine." ^ Arthur Magazine article: ""So Righteous to Love": Devendra Banhart, interviewed by Trinie Dalton (Arthur No. 10/May 2004)." ^ Schreiber, Abby (July 12, 2012). "Devendra Banhart on His New Album His Thoughts on the EDM Scene and Making Ostrich Egg Omelets With Beck". Papermag. Retrieved 2012-07-27. ^ "Devendra Banhart Coast to Coast – The Roxy, Boston, MA and the Orpheum Theater, Los Angeles, CA". Junk Media. Archived from the original on April 13, 2009. Retrieved November 9, 2007. Wikimedia Commons has media related to Devendra Banhart. "Devendra Banhart". XL Recordings. Archived from the original on July 10, 2009. "Devendra Banhart". Young God Records. Archived from the original on May 23, 2009.